Fabulous card, grat image, with all the ships and yachts that come into Gib you should be selling these on the quay side, go down a bomb. 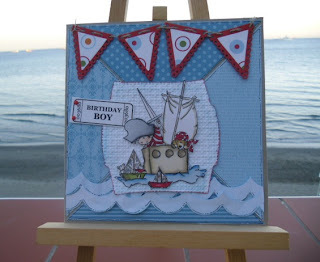 Great boy's card Sylvie. Love it. I can't keep up with you Sylvie! I absolutely love the image on this one - what a fabulous card! Fabulous card Sylvie, I like the image and that bunting. Wow, I love your card, fab detail and a lovely scene you have created. Thanks for taking part in this weeks LOTV Challenge!